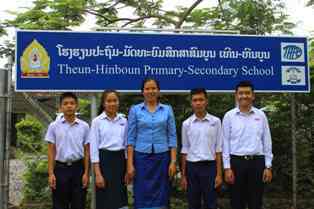 Four pupils at the Theun-Hinboun School in Khounkham District, Khammouane Province have achieved rankings in the national examinations for gifted students. Somsavath Sykham, a final-year student in the school’s upper secondary section, was one of 20 students selected from across the country to take the national exams in Vientiane in late April after coming first in exams at both district and provincial level. Somsavath was placed fifteenth in the national mathematics exam, a result which delighted the 17-year-old boy, his family and the school. The school opened in 1996 at the Theun-Hinboun Power Company (THPC) operations camp in Khounkham. Half of the pupils currently enrolled are the children of THPC staff and the other half come from surrounding villages. THPC policy stresses the long-term value of education development and the school formed one of the company’s first investments in this area. Three 15-year-old students from the school’s lower secondary section also topped their district and provincial results and qualified for the national exams. Miss Patthana Muangbak came sixth in the country for Chemistry, Ketsana Vongpatta finished seventh in maths and Pasith Xaynavong ranked eighth in Lao. Ajaan Khamwai is in no doubt as to why the school is able to regulalry achieve high level results. “We offer extra classes to the best performing children in the class each year, and we can do this because THPC covers our administration costs and provides the school with good equipment and materials”.